1. i did a mock booking in philippine airlines website in order to choose my preferred flights, taking note of the flight schedule and flight code. after i clicked on those radio buttons, i had a total of Php3,600++ for my round-trip tickets from cebu to manila and i'm flying in economy class. if you have a photographic memory and remembering all the details of your flight schedule is a breeze, then you don't need to jot down the details or print screen the entire web page for your reference when making your reservations. 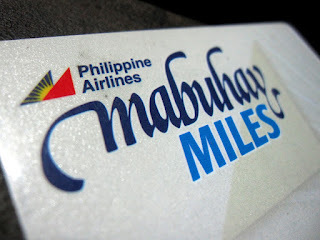 2. i then called up the cebu number for philippine airline reservations to have my round-trip tickets ready for booking. 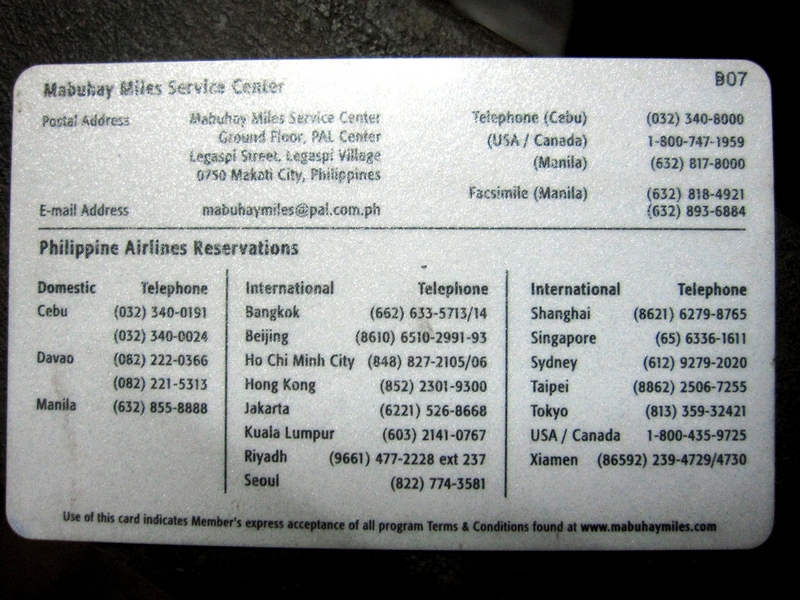 contact numbers are written at the back of the mabuhay miles card. i don't have a photographic memory so while i did my mock booking, i also made my reservations. i know, you really don't have to write everything down because it's far convenient if you're staring at the website by the time you make that call. and it's better if you already plan out your flight schedule because i got the impression that the customer service expects you to know your intended flights beforehand. i was then put on hold and was told to wait a minute or two while the lady on the other end of the line confirmed my flights. i seemed to be lucky at that time for i got my planned flights reserved and i only had to pay almost Php1,500 of numerous taxes and surcharge but a Php2,000++ less was nothing i could complain about. i also took a note of my booking reference which the customer service would dictate to you letter by letter, alpha, bravo, tango etc. keep in mind that you will be given 3 days to get and pay for your tickets in the PAL office most convenient to you, after you made your reservations. if you're not buying miles or transferring miles, then you only need to concern this part of the document. and also this bottom part which i failed to look into. click the picture to have a better view. this was pointed out by the woman who processed my form in the PAL office. learn from me and make sure to bring the requirements before you head to a PAL office. 4. lastly, i went to a PAL office to pay and get my travel award tickets. for cebu people, there are two PAL offices, one is in sm city cebu and the other one is along osmeña boulevard, ymca building. the latter was a good choice since it isn't that well-known unlike its mall counterpart. so, i wasn't complaining when i was asked to make photocopies of the travel redemption form and my ID because there were only 3 customers including me at that time against a hefty number of PAL personnel. anyway, the fault was on me for not reading thoroughly the form. after paying for the taxes and other travel fees, amounting to about Php1,500, i finally had my tickets reserved and confirmed. during the entire process of redeeming my award tickets, i was glad that my experience was far below my threshold. at least, i didn't have to worry about a customer service representative that isn't really of service to customers and a PAL personnel who's too tired and had enough for the day. it's best if you already have made reservations ahead and your requirements ready before going to a PAL office and also go there in the morning, when people at PAL are beaming with new stories/gossips to talk about. they're more than happy to help you. 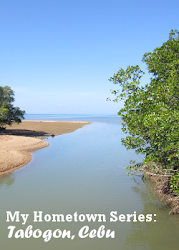 you can get the form from here. one-way ticket (Cebu to Manila) is worth 4000 mabuhay miles.